Stylish Star Allu Arjun has once again proved how kind hearted he is. 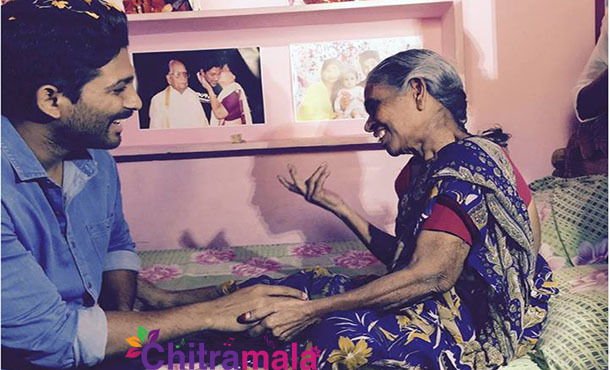 Arjun, who donated Rs 25Lakh for Chennai flood victims, has now visited his 65-year-old fan Mastan Bee who is suffering from Cancer in Vijayawada. Mastan Bee has been suffering from Cancer since a while has wished to see her favorite hero Allu Arjun. Since her health not permitting her to come Hyderabad and visit him, she was left in disappointment. It was TV9- a news channel that telecasted her story and published about her wish of meeting Allu Arjun. Moved by Mastan Bee’s story, Allu Arjun halted his shooting and flew all the way to Vijayawada and met. Currently the hero is shooting for Boyapati Srinu’s ‘Sarainodu’ in Hyderabad. Thrilled with Arjun’s visit, Mastan Bee was all happy. As he entered into the house and sat behind her, Mastan Bee took Allu Arjun’s hand into her hands and started touching them, while Allu Arjun was looking her in all smiles. Mastan Bee broke into happy tears seeing Bunny and had a long chat with the actor with all smiles. She expressed that she is also a big fan of his grandfather, Allu Ramalingayya.In the past other heroes like Pawan Kalyan, Mahesh Babu, NTR and Ram Charan have also done the same thing by visiting their fans who were ill and fighting not curable disease.